Book one now to save time and hassle so you can focus on the celebrations. 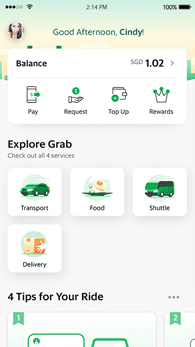 It’s as easy as booking a Grab ride! Pro tip: You can book up to 10 GrabExpress elves to help you save time. 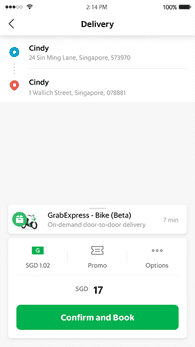 Open your Grab app, and click on the ‘Delivery’ thumbnail. Enter your pick up address and your recipient’s address. 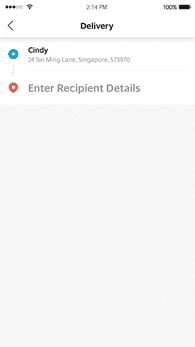 Fill in the recipient details. Click ‘Confirm’ and ‘Book’ and your package will be picked up and delivered within minutes. 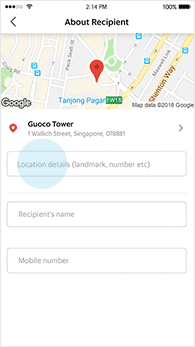 Q: What items can I send with GrabExpress? Q: Can GrabExpress do advanced booking or keep a parcel overnight for next day delivery? A: Unfortunately, we do not accept advanced bookings or next day delivery at the moment. A: We operate 8am–11pm, 7 days in a weekNo, you need to be physically present in the requested location. A: Our pick-up and destination delivery areas are available islandwide except a few restricted areas.